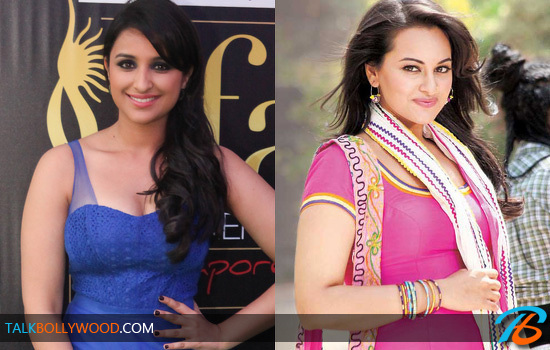 Sonakshi or Parineeti: Who will play the lead in Happy New Year? Shahrukh Khan and Farah Khan will be teaming up yet again for Happy New Year. After their patch up, Farah had confirmed that the film will go on floors in December this year. Happy New Year is apparently about a group of friends who want to win the World Dance Championship. The problem however is that each one of them is a bad dancer! The film will have 4 male characters and other than Shah Rukh Khan, John Abraham, Abhishek Bachchan and Boman Irani are tipped to play the other leads in the film. However the hunt for the leading lady is still on. It is said that the lead actress in Farah Khan’s Happy New Year will be a Bhandup bar dancer and so far no one has been signed for it. Earlier it was speculated that Priyanka Chopra will be playing the lead but according to sources the production house is now looking for another actress. While many names have cropped one, Parineeti Chopra and Sonakshi Sinha are apparently on the top of the list. SRK and Farah are said to be impressed with both these girls. Parineeti and Sonakshi are slated to give their screen test soon and one of them will be chosen to play the lead opposite Shah Rukh Khan. So who do you want to see with SRK? Parineeti or Sonakshi? Stayed tuned for an official confirmation on this very soon!